Liverpool and Netherlands stalwart Virgil van Dijk is the most important player in the Premier League. Hear me out. The players that win illustrious awards, such as the PFA Players’ Player of the Year and Ballon d’Or, are often attacking players but defenders are the unsung heroes of the beautiful game. It’s been 13 years since Italy’s Fabio Cannavaro won the Ballon d’Or. The 2006 award was also the closest a goalkeeper has come to winning since Lev Yashin’s 1963 triumph; as Gigi Buffon finished second to his fellow countryman. Cannavaro and Buffon were instrumental in their nation’s first World Cup since the ’80s as the Italians managed five clean sheets throughout the tournament – the best that year. Since then, aside from Manuel Neuer’s bronze award in 2014, only midfielders and forwards have been inside the top three for the prize. Shifting the narrative back to Liverpool – what names are the kids on the street shouting as they take aim at the inside corner of a purple wheelie bin? They’re shouting “Salah!”, “Mane!”, “Firmino!” or maybe even “Shaqiri!” if they’re keen on the Swiss super-sub. I don’t expect children to throw in a big Claude Makelele tackle on their mates and exclaim “van Dijk!” but it shows how easy it is to overlook the less glamorous aspect of football. Manchester City were incredible in the Premier League last year; they broke the record for most points in a season (100) and were 19 points clear of second place. The Citizens are on course to finish with a similar points tally this season too, but there’s one titanic difference – and that’s Liverpool. As I write this, as the table stands, the Reds are two points clear of City with seven games remaining (eight for the reigning champions). At this stage last season, Jurgen Klopp’s Liverpool were placed third on 63 points – 18 points behind City. Our transformation under the German has been incredible. Klopp has signed 17 players for Liverpool and, ignoring the prices we paid for them, van Dijk and Alisson are definitely two of the best. The Reds have kept 28 clean sheets since van Dijk signed – the most in the Premier League in that period. This season, with reinforcement of Alisson in goal, Liverpool have conceded just 18 goals in 31 games – again, the most in the league. 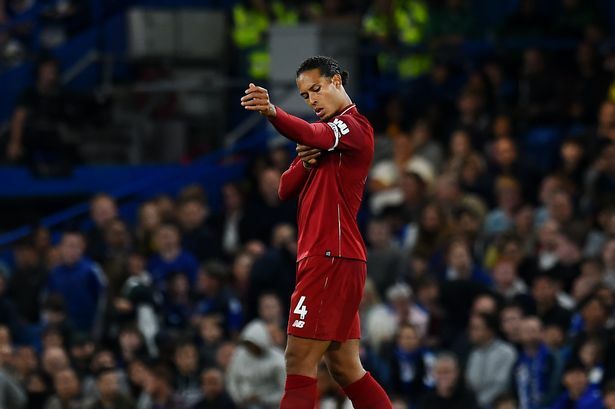 It’s hardly a surprise that players – past and present – have been lauding van Dijk, as he’s transforming into one of the finest defenders in world football before our eyes. This season Liverpool have fielded five centre back partners with van Dijk but, aside from suspensions, he’s the only real constant. The Reds, in recent years, haven’t been known having an air tight defence but the Dutch skipper changed that. He’s been outstanding – and he’ll be at the epicentre of the explosion that will be Liverpool fans’ joy if the Premier League title comes to Anfield.